Source: Engraving from Apocalypsis, or The revelation of certain notorious advancers of heresie. London, 1655. Scan provided by the Mennonite Archives of Ontario. Melchior Rinck (Rink, Ring, Ringk, Grink), (1494-after 1545), an Anabaptist martyr of Hesse, Germany, the outstanding leader of the Anabaptists in Hesse. He was educated at the universities of Leipzig and Erfurt, some of his professors being humanists. His nickname "the Greek" is probably an allusion to a good mastery of Greek. He was said to have participated in the fanatical disturbances of the Zwickau prophets in Wittenberg as early as 1520 or 1521 (Ottius, 7); but this is probably an erroneous assumption. The first certain information about him after this time says that he was a schoolmaster (chaplain) in Hersfeld (not in the village, but in the city and the Stift) in 1523. Here he became the good friend of the pastor Heinrich Fuchs, and worked enthusiastically with him to promote Luther's ideas. The Stift authorities, however, induced the abbot to dismiss him; when this happened in December 1523 some disturbances occurred. The landgrave then had Rinck and Fuchs arrested, but they were released; they were then permanently expelled from Hersfeld and Hesse. The two friends now turned to Thuringia where Rinck secured a pastorate in Oberhausen near Eisenach and later in Eckardtshausen. He married Anna, the daughter of Hans Eckard. He soon fell under the influence of Müntzer and (according to a report by Eberhard von der Tann) took an active part in the Peasants' War, especially in the battle at Frankenhausen. 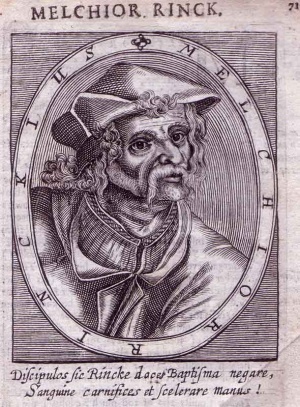 Fuchs lost his life, but Melchior Rinck tried to continue Müntzer's work by means of strong polemics against Luther's doctrine of justification, the proper fruits of which he thought he missed everywhere. Henceforth he was homeless and led the life of a wanderer. In the spring of 1527 he is thought to have met Hans Denck, Ludwig Haetzer, and Jakob Kautz in Worms and with them signed the seven articles for the disputation with the Lutheran clergy. In 1528 he stayed most of the time around Hersfeld on the Thuringian border, preaching Anabaptist doctrine. There is no sign of seditious intentions on his part. His principal concern was the refutation of infant baptism and the gathering of quiet Christians, tried and tested in life and in suffering, who would enter upon the discipleship of Jesus. He attacked infant baptism because "original sin does not condemn before the person reaches the years of reason and wills to sin." He asserted that a man must first be taught of God before he is baptized, for faith comes by hearing; but without faith baptism is nothing; the child is not a Christian and must first be taught the Word like adults. From this faith issues, and afterwards baptism; for with the heart one believes and by confession one secures salvation. He rejected the bodily presence of Christ in the Lord's Supper, but did not venture into speculation or dispute on this point. Rinck found a considerable following, and therefore ventured to ask permission to preach openly in Hersfeld. His request reached Philip of Hesse, who summoned him to a personal conversation in his hunting lodge Friedewald and gave him a choice between recanting and presenting his teachings to the theologians of the faculty of the University of Marburg. Rinck chose the latter, and thus a disputation was held at Marburg on 17 and 18 February 1528, the rector of the university acting as chairman. The debate was led principally by Balthasar Raid, a Hersfeld clergyman. Raid sent an exact report of the course of the debate to Philip (given verbatim in Thüringen, 294-302). Melchior Rinck was required to present his doctrines in five points in written form. The first three concerned the creation of man and his fall and need of redemption. On these there was no difference of opinion. The difference of opinion arose when the question of baptism was opened. Since no agreement could be reached on this subject, the last point, concerning communion, was not touched at all. As a penalty for his obstinacy Rinck was sentenced to imprisonment upon the insistence of John the Steadfast, Elector of Saxony, and paid this penalty in Haina on the Wohra. But records of this punishment vary. Hochhuth says he was sentenced to public church confession, and Wappler says that he was expelled from the country. But undeterred by all the persecution Rinck at once resumed his quiet gathering of converts. The elector, however, had him sharply watched by his bailiff on the Wartburg, Eberhard von der Tann. But he was not apprehended on Saxon soil; if he had been, his life would certainly have been forfeit. When he was seized in Hesse, Saxony tried by all the means at its disposal to influence Philip to institute a formal heresy trial with the obvious intention of having him executed. Philip did not yield, but punished Rinck with a light sentence of imprisonment, and after half a year released him upon the sole condition that he would never again set foot upon the soil of Hesse or Saxony. Rinck had not long to enjoy his liberty. On 11 November 1531, he was again seized, in Vacha on the Werra, with eleven companions, while he was preaching on Mark 16:16, one of his favorite texts. Again Saxony interfered and in a personal letter the elector insisted that Philip impose the supreme penalty on Rinck on the basis of the edict of Speyer of 1529 and the official opinion of 1531 by the theologians of Wittenberg. But in vain. Rinck was condemned instead to perpetual imprisonment, having rejected the plea of his friend Georg Witzel, who had just paid a visit to his native town of Vacha, to recant his views on baptism and to stop performing it. He was taken to Bärbach in the district of Katzenelnbogen, and was still there in 1551. In 1540 his chains were eased upon Bucer's intervention after Peter Tesch joined the established church. He probably died in prison, since Peter Tesch had tried in vain to convert him. All of Rinck's writings but three have been lost. One of these is an epistle written conjointly with Antonius Jacobsz, which was actually a broadside (Flugschrift) on infant baptism. It was published by Cramer (Samuel Cramer and Fredrik Pijper. Bibliotheca Reformatoria Neerlandica, 10 vols. The Hague: M. Nijhoff, 1903-1914: v. V, 642-44). Another writing was the letter to Eberhard von der Tann, written in prison at Haina, published by both Wappler (Kursachsen, 149-52) and Franz (Günther Franz, Urkundliche Quellen zur hessischen Reformationsgeschichte, IV Band: Wiedertäuferakten 1527-1626. Marburg: N.G. Elwert, 1951: No. 14a, pp. 33-37). Both are effective evidence of his earnest Christian attitude. In 1958 a hitherto unknown writing by Rinck, Widerlegung einer Schrift, so Johannes Bader . . . Pfarrher zu Landau, neulich than hat, den Kindertauff als christlich zu erhalten (manuscript), was discovered in the Frankfurt University Library (see Mennonitische Geschichtsblätter : 48 f). Rinck baptized Hans Peisker on 26 January 1536. Others whom he is known to have baptized were Gilg Scherer (also called vom Berge), of Motzfeld, the leader of the congregation at Sorga, near Hersfeld. Among his most loyal followers were Hans Both and Margaretha, "the old cook" (Garköchin). Cramer, Samuel and Fredrik Pijper. Bibliotheca Reformatoria Neerlandica. The Hague: M. Nijhoff, 1903-1914: v. V.
Cornelius, C. A. Geschichte des Münsterischen Aufruhrs II. Leipzig, 1860. Corpus Reformatorum, Opera Melanchthon's II. Dersch, Wilhelm. "Das Vorspiel der Reformation in Hersfeld." Zeitschrift des Vereins für hessische Geschichte 1909: 91 ff. Die Religion in Geschichte and Gegenwart, 2.ed., 5 v. Tübingen: Mohr, 1927-1932: v. IX, Col. 2039 (article by Walther Köhler). Franz, Günther. Urkundliche Quellen zur hessischen Reformationsgeschichte, IV Band: Wiedertäuferakten 1527-1626. Marburg: N.G. Elwert, 1951. Grouwelen der voornaemster Hooft-Ketteren . . . . Leiden, 1623. Hege, Christian and Christian Neff. Mennonitisches Lexikon, 4 vols. Frankfurt & Weierhof: Hege; Karlsruhe: Schneider, 1913-1967: v. III, 515 f.
Herzog, J. J. and Albert Hauck. Realencyclopedie für Protestantische Theologie and Kirche, 24 vols. 3rd ed. Leipzig: J. H. Hinrichs, 1896-1913: v. XVII, 17, Carl Mirbt with an exact bibliography. Hochhuth, K. W. H. "Mitteilungen aus der protestantischen Sektengeschichte in der hessischen Kirche: Landgraf Philipp und die Wiedertäufer." Zeitschrift für historische Theologie (1858): 541-53. Jacobs, Eduard. "Die Wiedertäufer am Harz." Zeitschrift des Harz-Vereins für Geschichte und Altertumskunde (1899): 427, 428, 434-36, 440 f., 466 f., 480, 501, 522, 526, 528, 531. Leendertz, W. I. Melchior Hofman. Haarlem, 1885: 341-48, Supplement 1, "Overzicht van het Leven van Melchior Rinck". Linden, F. O. zur. Melchior Hofmann, ein Prophet der Wiedertäufer. Haarlem and Leipzig, 1885: 74 and 171. Maurer, W. "Gestalten aus der hessischen Täufergeschichte I: Melchior Rinck." Pastoralblatt für Kurhessen-Waldeck (1953): No. I, pp. 10-12. Ottius, J. H. Annales Anabaptistici. Basel, 1672. Wiswedel, Wilhelm. Bilder and Führergestalten aus dem Täufertum, 3 vols. Kassel: J.G. Oncken Verlag, 1928-1952: 108 ff. Schowalter, Paul. "Rinck, Melchior (1494-After 1545)." Global Anabaptist Mennonite Encyclopedia Online. 1959. Web. 18 Apr 2019. http://gameo.org/index.php?title=Rinck,_Melchior_(1494-After_1545)&oldid=146167. Schowalter, Paul. (1959). Rinck, Melchior (1494-After 1545). Global Anabaptist Mennonite Encyclopedia Online. Retrieved 18 April 2019, from http://gameo.org/index.php?title=Rinck,_Melchior_(1494-After_1545)&oldid=146167. Adapted by permission of Herald Press, Harrisonburg, Virginia, from Mennonite Encyclopedia, Vol. 4, pp. 336-338. All rights reserved.